My 4 year old is all about fashion these days. She fights me to wear anything other than a skirt to preschool, which has been a definite 'no' given the incredibly cold winter we've had this year in Georgia. But I'm determined to fill her wardrobe with skirts galore for this coming spring and summer so she can prance around to tea parties and frilly delights til her hearts content. I'm a VERY novice sewer, so it's exciting to see so many great beginner tutorials online. 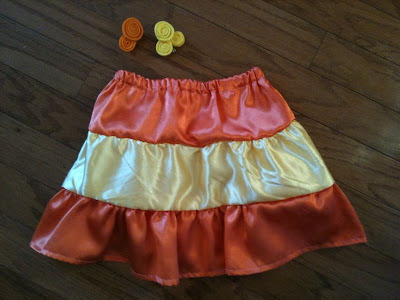 I found a tiered skirt tutorial from Kuky Ideas that was very easy and super cute. I loved her precise measurements so there wasn't any guessing involved and you could tailor it to fit any age. I used some silk satin found in the fabric clearance bins at Joann's so in total, the entire project cost about $2. I also made a couple felt rosette clips to match. I love this idea. I really need to do some for Makayla and Ava. I love the price of it as well. I love the fabric, and I know your daughter will, too, b/c it's shiny and pretty.